Yang Wei-te was lying prostrate before the Chinese emperor one day early in July, AD 1054. Yang was the Director of the astronomical bureau in the Sung empire and was reporting the appearance of a ``guest star". He may have been somewhat fearful of not having been able to foretell the coming of this new star, which appeared in the sky, as if out of nowhere. Astronomy was risky business in the middle ages. The legend has it that the Chinese astronomers Ho and Hsi (two brothers) were beheaded by their emperor for failing to predict a solar eclipse. The guest star of AD 1054 was also seen by Japanese astronomers in June of the same year and recorded. This could possibly have been a reason why Yang seemed to be apprehensive while reporting his discovery, although information must have passed only slowly between widely separated places in that era. He made references to the position of the guest star not being in a nearby star cluster of the Hyades which he made out to indicate that a person of great wisdom and virtue was to be found in the part of China under the emperor. This was an oblique compliment, which was well received by the emperor and the discovery was recorded by the office of the archives, only to be stored and copied and recopied by Chinese record keepers over the centuries. Astronomical conjunctions take place when several planets line up in the sky, sometimes with a sliver of the moon nearby. The objects congregate into a small region of the sky, soon to disperse to different regions within a few days. The bright new star remained in the constellation of Taurus the bull. It remained visible in that position for almost two years before fading away. The planets and the moon move so quickly across the sky because they are relatively close to the earth. The fact that the new star remained "motionless" implies (to the modern astronomers) that this new object was far, far away. Medieval Chinese records of the Sung dynasty further inform us that the guest star was visible in the daytime, like Venus "with pointed rays in every direction", whose "colour was reddish white" and "was seen like that for twenty-three days altogether". After this, it ceased to be visible in daytime, but remained in the evening sky for 630 days, finally fading from view to the naked eye in the evening twilight of AD 1056. Imagine how surprised an ancient sun-worshiping priest among the Anasazi Indians may have been to see the same bright new star apperaing "out of the blue" near the lower tip of the quarter moon one fine early morning. The Anasazi Indians (prehistoric Pueblo Indians) lived in what is now known as New Mexico, U.S.A. They had a Sun-watching shrine in Chaco Canyon with a view of the sunrise throughout the year. They observed summer and winter solstices to establish a calendar, possibly for some agricultural and social purposes. The moon and the bright new star, rose an hour or so ahead of the morning sun. The motif of the star and a quarter moon appeared on a sandstone roof in the shrine of Chaco-Canyon. Modern astronomers could calculate that around July 5th in the year of the ``Guest Star", i.e. AD 1054, such a conjunction would have happened within a few degrees in the sky. A similar picture was discovered at other prehistoric sites nearby, -- a notable one was found by two American astronomers, Helmut Abt and William Miller in the early 1950s in a cave in White Mesa, in the neighbouring state of Arizona. It was painted in red haemetite on the wall of the cave. The guest star of AD 1054 was not the only example of its kind. Chinese and Japanese astronomers have recorded several other events, such as in AD 1006 and AD 1181, which also appeared unprecedented and bright in a region of the sky, remained motionless and slowly faded away over a long period of time. We now know that these are spectacular explosions of massive stars in the sky called supernovae where temporarily, the brightness of the exploding single star becomes comparable to that of an entire galaxy of stars. These explosions happen only a few times per century in a galaxy like ours, the Milky Way, but are the source of all heavy elements which are important to life. The event of AD 1054 has now been convincingly associated with the remnant of the Crab Supernova (discovered in the modern era by the English amateur astronomer John Bevis in 1731 and independently by the French "comet-seeker" Charles Messier several years later). The process of unraveling the mystery of new objects in the universe often takes many years, and sometimes the search is as exciting as a chase. Several pieces of a jigsaw puzzle had to fall in place before the new star of AD 1054 noted by ancient sky-watchers around the world could be connected with the Crab supernova explosion of the modern era. To recount this part of the story, a few steps in the logical connection need to be recalled. After all, how does one know whether what the oriental sky-watchers saw nearly a thousand years ago, is one and the same object that one can only see through telescopes today? Towards the end of the nineteenth century, technological advances replaced direct visual observations of nebulae and other extended objects in the sky by astronomical photography. In 1921, using the 60-inch reflecting telescope at the Mount Wilson Observatory near Pasadena, California J. C. Duncan saw that the filamentary structures in the Crab nebula were undergoing expansion (see the photograph below from Duncan's publication and also the Science magazine article of Mayall). He measured the rate of this expansion by comparing the photograph with a similar one taken eleven and a half years before. 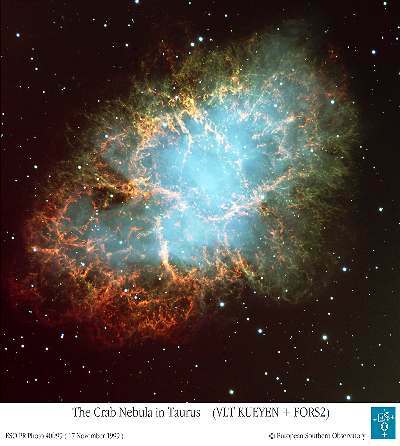 That the Crab nebula belonged to the "Super"nova class (abbreviated SN), which are much more powerful than other lesser violent explosions such as ordinary novae (which, generally, fade away more quickly) became clear, once the distance to the nebula was established to be more than 5000 light years away. The apparent brightness of a source of light falls as one moves away from it. Even at such enormous distances, the brightness of supernovae still remained large enough to be comparable to that of Venus which is only our next door neighbour, in astronomical terms (Venus is at the longest separation only 14 light-minutes away from the earth). The Crab nebula was the first of its category of objects, which has left remnants of this enormous and previously unknown type of explosion called a supernova. The distance to the Crab nebula (and the intrinsic (at source) luminosity) was established by N. U. Mayall who measured the position of known (atomic) lines in its spectrum. Much as the whistle from a receding train has a lower pitch, the speed of the moving gas of the shells in the nebula could be determined by the shape and shifts of the lines in Crab's optical spectrum. Comparison of this speed along the line of sight to the speed determined earlier by Duncan (in the plane of the sky) immediately gave the Crab's distance and its intrinsic luminosity from the records of the Chinese and Japanese ancient sky-watchers. Enter the well-known Dutch astronomer Jan Oort (whose birth centenary was celebrated in April, 2000). When he visited the U.S. before the second world war in 1939, these new findings interested him greatly. On his return to Leiden, Oort sought the help of a Professor of Chinese Language at Leiden University, J.J.L. Duyvendak. Holland was already under occupation by Nazi Germany and eventually the University at Leiden would be closed down. Nevertheless, Duyvendak located additional Chinese records which contained the new piece of information that the star was visible in daylight for 23 days and in the night sky for two years. The results were sent out of Nazi occupied Holland by Oort to the U.S. via neutral Sweden where they were published in a journal managed by the Astronomical Society of the Pacific. Oort (with Mayall) appended a note to Duyvendak's findings regarding astronomical implications and brought out a possible slight discrepancy in the reported position of the guest star in Sung dynasty records. This is a remarkable example of an international scientific cooperation across scholarly disciplines and national boundaries, -- even among scientists of nations belonging to enemy camps during the time of a major war. Most notable among the other supernovae in the pre-Renaissance era were those of AD 1006 and AD 1181. The first occurred in the constellation of Lupus on April 30th, in the southern hemisphere and was particularly bright. The second was in Cassiopeia on August 6th. Sung dynasty records show that the star of AD 1006 shone so brightly that objects could be seen by its light and it cast shadows. It was also seen by Japanese and Arab astronomers. It was visible for about three and a half months after which it disappeared behind the glare of the sun, as earth's position moved in its orbit. It reappeared after seven months, this time in the morning sky. The star was visible like this, off and on, for at least two years; Chinese records state that it was visible until AD 1016, i.e for ten years. The supernova of AD 1181 was observed from multiple sites, two of which were in China and another in Japan. No South Asian description of the AD 1054 supernova event has been found so far from old astronomical or historical records (Narlikar and Bhate, 2001 completed a recent effort), although possible middle eastern sightings (by Ibn Butlan who lived in Cairo and Constantinople between 1052 and 1055) have been mentioned. European records of Crab sightings (through the Rampona Chronicle, complied long after the event) have been claimed (see for example the report by Collins et al which suggested that Crab was seen several weeks before the earliest, accepted Japanese sighting) but may require further scrutiny. The absence of clear records in these parts of the world is somewhat surprising, since the earlier SN 1006 was seen by Hepidannus in St Gall in Switzerland and the SN of AD 1054 would have been observable in much of central India during summer nights. Although the months during which it was visible in the daytime were during the monsoon, it is unlikely that it would be missed for so many nights due to cloud cover. What was it like in the Indian subcontinent and its environs at that time? Where could one possibly look for any evidence of these new stars? India had already become a seafaring nation some centuries before this, and had close cultural and political ties with Southeast Asian nations. Navigation on open seas would have required good knowledge of the position of the stars. There were also a number of visitors to and from India, the erudite among whom may perhaps have noticed the supernovae during their travels or could have brought information about them. A notable South Indian king in this period who had influence overseas in South East Asia was the Chola emperor, Rajendra I. His strategic space extended northwards along the eastern coastline of India up to the river Ganga in southern Bengal. He also had trade links with China. The Tiruvalanudu copper plates (c. 1025) proclaim the conquest of Kataha (modern Kedah in Malaysia) and the seizure of the capital city of Srivijaya (in Sumatra, Indonesia) during Rajendra's reign. Trade may have inspired the Chola expedition against the maritime power of Srivijaya which had attempted to interrupt the trade link of the Cholas with China. The Chola presence in South East Asia lasted about half a century, but it led to the spread of Hinduism and Indian art which had a long and profound influence there. Rajendra's father, King Rajaraja I (who reigned between AD 985 and 1014) had already acquired the northern part of Sri Lanka island. The Maldive Islands and the Malabar coast, both highly prized for their spices, were conquered by Rajaraja and had increased the prosperity of the Cholas. Rajaraja's famous copper plate inscription records the construction of the Buddhist Vihara at Nagapattinam, a major Chola port. This Vihara, known as the Chudamani Vihara, was constructed around AD 1006, the same year as that of the bright supernova in the constellation of Lupus. The Sailendra king, Sri Maravijayottungavarman constructed the Vihara with the assent and cooperation of Rajaraja. The Brhadisvara temple in Thanjavur was also constructed early in the 11th century during Rajaraja's reign. During the period between AD 800 to 1200, Cambodian kings constructed a number of prosperous cities near Siem Reap. The Angkor civilization in Cambodia reached its brilliant peak around the 1100s. Angkor Wat -- a set of Vishnu and Shiva temples, were constructed in the first half of 12th century. It was also used as an astronomical observatory. In the year AD 1181, the Khmer king Jayavarman VII, ascended the throne at the age of sixty, after chasing out the Cham (south Vietnamese) destroyers of Angkor and a fierce battle on the Cambodian lakes. Jayavarman ruled Cambodia till AD 1220. On the western coast of India, the Chalukyas (of Kalyani) ruled between AD 1025 to AD 1150. Two Parsi settlements, one in Sanjayanti and another in Sthanaka (near Mumbai islands) were recorded in c. 936 and c. 1081 respectively. This ancient Zoroastrian community had first landed in Divi (Diu) on the coast of Gujarat in AD 917, having made their journey across the Arabian sea, fleeing the Islamic invasion of Persia. In central and western India, the temples in Khajuraho were in the middle of their two century long construction, while the Jain temples in Mount Abu were begun a few decades before AD 1054. While South Indian kings were expanding their empire eastward, India's northwestern flank was under attack from invasions from central Asia. A prominent visitor from central Asia, the Islamic scholar Al-Biruni, (AD 973 - 1048), came to India after AD 1020. He may have been forced to accompany Mahmud of Ghazni (in Afghanistan, where he resided by this time), as the latter raided north India. Al-Biruni's works on astronomy were well known and widely utilised. He also wrote a highly regarded work on Indian geography, philosophy, religion and science (including Indian astronomy) called Tarikh-i-Hind around AD 1030. Al-Biruni studied Indian literature in the original and translated Sanskrit texts into Arabic. He treated with care the observational facts which did not fit the favourite theories of the era and the analysis of errors of measurement. When the SN1006 exploded, Al-Biruni was in his homeland (Khwarazm, a region adjoining the Aral sea in what is currently Uzbekistan), back after being away during political upheavals and civil wars in his youth. He worked there (AD 1004 to 1016) with his former teacher Abu Nasr Mansur, a famous astronomer and mathematician himself. Al-Biruni finally settled in Ghazni and died in 1048, continuing an enormous scientific output right upto his death. Only about a fifth of his works seem to have survived, to be found in the modern age. Click here for a map of India during Al-Biruni's time (Filesize: 246 kB). AD 1054 is the year in which Atish Dipankar, Buddhist monk and missionary, still a household name in Bengal after many centuries, died in Tibet. Dipankar lived in Tibet for many years and was singularly influential for the spread of Buddhism there. Here is a map depicting the cultural sites of India in the 8th-12th century AD; Filesize: 325kB; Part 2 of the map is here (Filesize: 353 kB). Who were the scholars in the Indian heartland at that time that were astronomically or mathematically inclined, and what were the texts or treatises that they wrote? Names of several such scholars from the 11th and 12th centuries, alive around the relevant dates are known from their commentaries on the Sanskrit astronomical text Surya-siddhanta (believed to have originated earlier) or for their own independent treatises. Many of them wrote their treatises several years before these events, with a few exceptions. Bhaskara II (AD 1114-1185), the head of the observatory in Ujjain wrote Siddhanta-siromani (AD 1150) and Karanakutuhala, while Mallikarjuna Suri (around AD 1178) wrote two commentaries, one in Sanskrit and another in Telugu. Other astronomers from this era were Chandesvara, a native of Mithila (Bihar) who wrote Surya-siddhanta-bhasya (also AD 1178) and Sripati who wrote Siddhanta-sekhara in AD 1039 and Dhruvamanasa (1056). Sripati was born (probably) around AD 1019 in Rohinikhanda in Maharashtra and in Dhruvamanasa he calculated planetary transits, and eclipses. His Siddhanta-sekhara was lost for centuries, but has since been recovered in South India. Dasabala, son of Vairocana, who wrote the Chintamanisaranika flourished around AD 1055. Somesvara (author of Aryabhatiya-vyakhya) and Satananda (author of Bhasvati) worked towards the end of the 11th century. Could it be that some evidence of the sightings of the supernovae of these centuries lie hidden at any of the mentioned historical sites, records and texts, in or near India? So far no evidence has been found, despite the recent efforts mentioned above. Investigations of past knowledge about astronomy have traditionally centred on human perception of the universe, primarily concerning the position of the earth (and the sun) in the scheme of the cosmos. But records on the previously unknown stars of ephemeral brightness can be of importance to an active area of research in modern astrophysics -- and would make a rather good detective story in their own right. Today, in contrast to the middle ages, Astronomer Royals are no longer at risk of being beheaded or kidnapped. Even by the early 17th century, certain astronomers seemed to seek a limited independence from the directives of their patrons. When excitement arose in AD 1604 over what is now known as Kepler's supernova, Gallileo may have been criticised by the Padua city council, for not having discovered the supernova. Gallileo apparently replied that he had more important things to do than to gaze out of the window, on the slim chance that he might catch something unusual. Some astronomical problems become interesting and relevant as technological changes open up new windows of observations. Apart from sociological changes, today astronomers (or physicists) can however give an advance warning of an impending supernova. Currently there are several underground laboratories, such as in the Kamioka and Sudbury mines of Japan and Canada, which can detect these explosions in our galaxy or its close neighbours, although their primary experimental goals are different. These experiments detect neutrinos, which cannot be seen by the eye or conventional telescopes but they arrive directly from the core of the exploding star a few hours before the explosion can be recorded through light. Detectable light can be seen only from the surface of a star, and the stellar surface gets the message about its exploding core later due to the time taken by shock waves to travel across the star. The delay itself would tell the size of the star that underwent explosion. This was the case when a supernova exploded in 1987 in our neighbouring galaxy, the Large Magellanic Cloud. (Supernova 1987A is the bright star near the centre with a cross in a larger view of the Large Magellanic Cloud). Scientists are now coordinating a network of such neutrino detectors (called SNEWS) to immediately contact each other over the internet if multiple experiments happen to see a signal within ten seconds. If a rare event like this happens in or near our galaxy, the network will issue an advance alert to astronomers to turn their conventional telescopes to a small region of the sky to observe the impending explosion. Astronomers will, for example, have a chance to catch the early ultraviolet rays coming out the exploding star by the Hubble Space Telescope should such an explosion happen near our galaxy (with telescope time already allocated in advance). The neutrinos detected in the meanwhile will reveal the state of the stellar core that collapsed, if the explosion takes place within the limited distances of the historical supernovae. In this business the evidence comes in slowly. And the closing of a case may take decades. The Crab Nebula seen through the Very Large Telescope (Kueyen) FORS2 instrument at Paranal, Chile; Copyright: European Southern Observatory. P. Murdin and L. Murdin, Supernovae, Cambridge University Press (1978). A. S. Wilson, Observatory, 103 (1054), 74, (1983). G. W. Collins et al, Publications of the Astronomical Society of the Pacific, 111, 871 (1999 July). J. C. Duncan, Proceedings of the National Academy of Sciences (U.S.A.), 7, 179 (1921). N. U. Mayall, Science, 137 (3524), p. 91 (13 July 1962). J. V. Narlikar and S. Bhate, Current Science, 81, 701 (25 Sept 2001). J. E. Schwartzberg et al (editors), A historical atlas of South Asia (Univ of Chicago Press 1978) pp 189-193. (Maps of South Asia in Al-Biruni's era and the Religious and Cultural sites during 8th-12th Century are from this source). J. J. O'Connor and E.F. Robertson, Abu Arrayhan Muhammad ibn Ahmad al-Biruni, (Nov 1999); see also Sripati in the same site (Feb 1997). The World Book - multimedia publications, World Book Inc. and IBM Corporation (1999). W. D. Arnett, Supernovae and nucleosynthesis (Princeton University Press, 1996). K. S. Shukla (ed. ), The Surya-siddhanta with the commentary of Paramesvara, Lucknow University (1957). Rene Taton (ed. ), Ancient and Medieval Science from prehistory to AD 1450 (Thames and Hudson, London, 1957), p 422. B. V. Subbarayappa and K.V. Sarma, Indian Astronomy, a source book (Nehru Centre, Bombay 1985), p 314. B. P. Groslier, Art of the World: Indochina -- art in the melting pot of races, (Methuen, London 1962) p 168. The Apsara image of Angkor Wat is from this source. A preliminary version of the current material appeared in ``Mother India" (Pondicherry), Sept and October issues (2000) (authored by A. Ray).